“Grammy” Ziegler sadly passed away in April of 2016, but she will always be in our hearts. Thanks to her son Aaron, her patterns will continue to be available for download here. Messages to the designer will not be answered as no one has access to the account. There will be no pattern support. Copyright to all of Deborah’s designs is now owned by her family. I asked one of my gran’girls to draw a heart for me. She did and of course I thought it was so cute. I loved the shape of it! So, I began designing this Hearts and Flowers Mat! 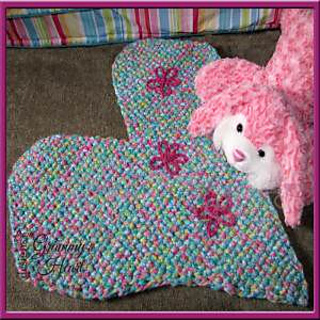 The Hearts and Flowers Mat is a quick project. It measures 26” x 24”. This pattern is written using Craft Yarn Council Standards. I highly recommend reading through the pattern before beginning. Remember, a pattern is a guideline for you. You should always try to express yourself!